Finding the best cooler backpacks for your next picnic, tailgating party, or hiking trip is a great way to keep your food and drinks safe and cold on your journey! We did the research to find several styles, sizes, and features that will work for just about anyone looking for an easy to carry cooler for their next outing! Before we get into the cooler backpack product reviews, here are a few key features you should know about before buying. Capacity: Many of the backpacks we reviewed note the cooler size based on how many 12 oz. cans fit inside. It’s also a good thing to know if you plan to use your backpack to bring drinks to your next picnic! 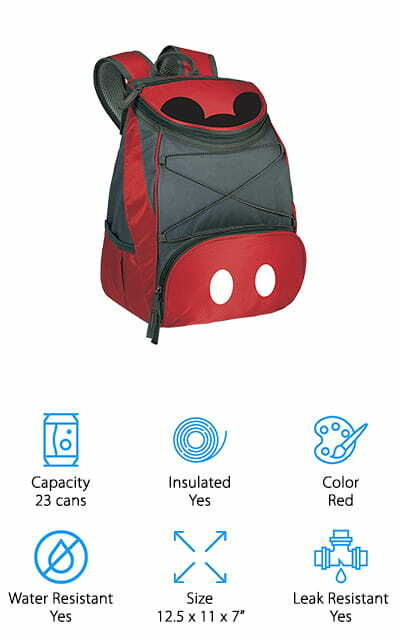 Insulated: An insulated cooler backpack has extra lining inside to keep its contents at the right temperature. They can be used to keep your drinks nice and cold with some ice or ice packs or keep dishes warm while you travel. Color: Your cooler backpack shouldn’t just work properly – it should match your style, too! Many of the backpacks we reviewed come in simple colors like black and grey, but many come in other fun colors too, like red, pink, or blue! Water Resistant: When we refer to a bag being “water resistant,” we’re talking about the bag’s outer fabric. Water resistant backpacks protect food and drinks packed inside in the event you get caught in the rain on the way to your picnic! Size: The bag’s size is important to note, especially if you need your bag to carry a lot of stuff! 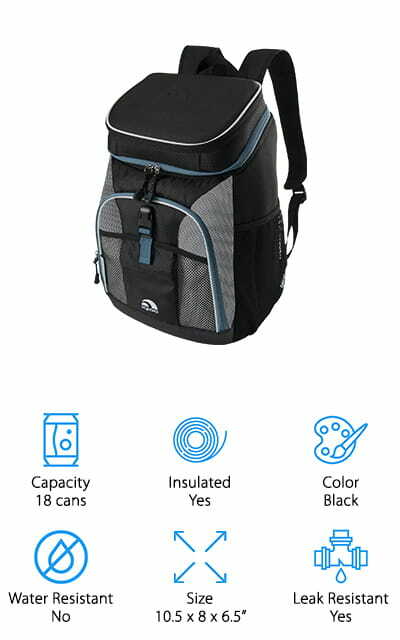 Many of the bags have separate cooler and backpack compartments, so you can carry drinks, food, a blanket, or extra clothes! Leak Resistant: In addition to cooler backpacks being insulated, some of them also have extra protective features to keep them leak resistant. These are great if you plan to add ice to your bag because they won’t leak as the ice melts! Now that you know all of the cool features these coolers have to offer, let’s get into the reviews! We found 10 amazing backpacks that are perfect for taking to an amusement park, trekking on your favorite hiking trail, or rooting on your child at their next sports game! If you’re strapped for time, no worries! We began with our Top Pick and Budget Pick, so start with those first. You can always come back to read about the rest! Let’s start with our pick for the best cooler backpack that has everything you need for your next picnic at the beach, park, or concert! 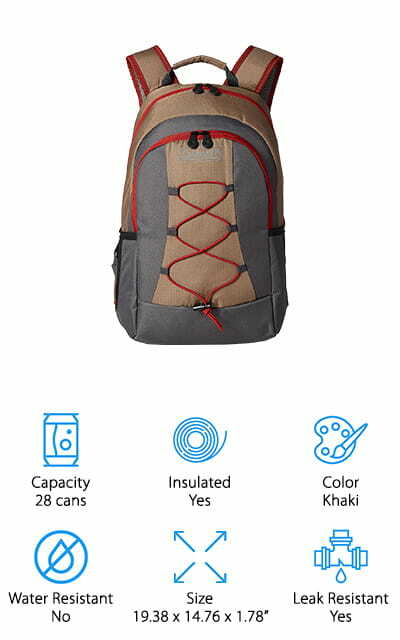 The large, insulated main compartment can hold up to 28 cans, which is a lot for such a compact backpack! Of course, you don’t have to just carry cans – it’s also great for food, 2-liter soda bottles, water bottles, and whatever else you bring on a picnic! It’s also leak resistant, so you can fill it with ice, or feel confident it won’t leak if a can or bottle leaks on your trip! There are also 2 side pockets for water bottles, umbrellas, or even a thin blanket. We also like that there is a waterproof front pocket for you to store plates, napkins, and utensils to keep them dry and easy to access. The water resistant outer fabric is thick, durable, and will keep the rain out if you get caught in a storm! When looking for the best cheap cooler backpack, we wanted to find one that worked well, held a lot, and wouldn’t break your budget. This cooler backpack from Coleman is not only inexpensive, it’s also a great backpack for your next outing! The main compartment is insulated and can hold up to 28 cans, so you should have no problem staying hydrated and happy on your next trip! It’s also leak resistant, so you can easily fill this with ice to keep everything nice and cold. There is a front compartment that stays dry, and it’s perfect for dry snacks, plates, and utensils. The two side pockets are great for storing water bottles, hand wipes, or other small extras. We also like the bungee lacing on the front, which you can use to attach a blanket or jacket. The straps are nice and padded, along with a waist strap to help you haul around a heavy bag full of food! 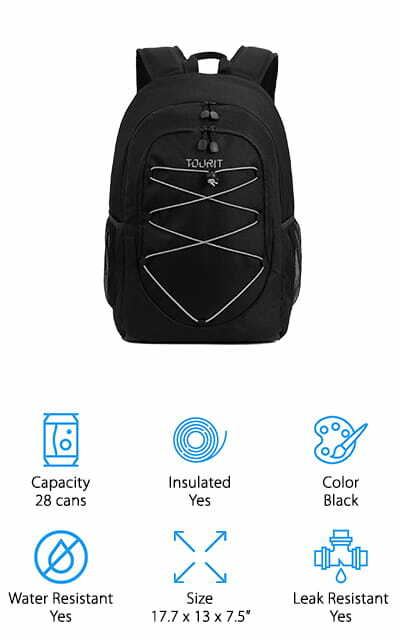 Another backpack we think is the best cooler for the money is this inexpensive and spacious backpack from Igloo! 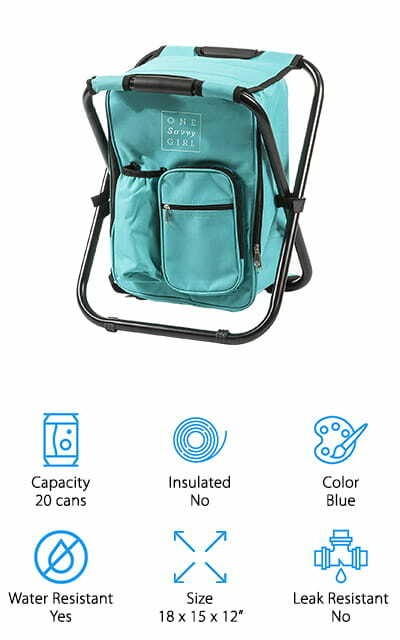 The main compartment can hold up to 18 cans, which is great for packing drinks, sandwiches, and snacks for a picnic at the park, or take it along to your child’s next sporting event. 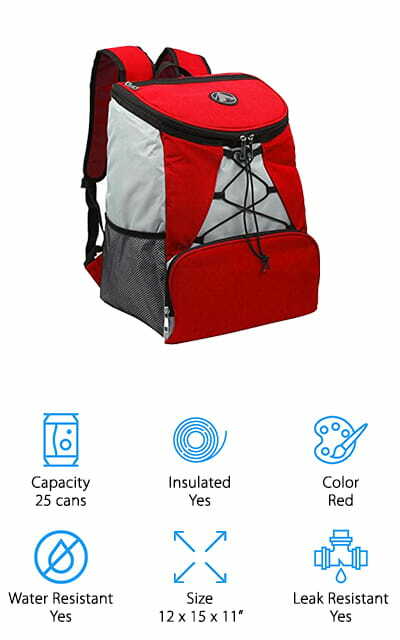 It has extra foam insulation to keep drinks and food extra cold, and the leak resistant lining allows you to pack in ice or ice packs without leaks. The bag is also lined in antimicrobial fabric, so you can feel confident that your food is clean and safe from bacteria. The top compartment is crushproof foam, so you can put delicate items like cupcakes or chips there to keep them safe. There are also 2 side pockets and a front pocket to store umbrellas, water bottles, and more small items. This is a great backpack for a couple or small family to take on their next outing! If you’re looking for the best cooler for camping, hunting, or hiking, grab one of these convenient backpack coolers from OAGear! 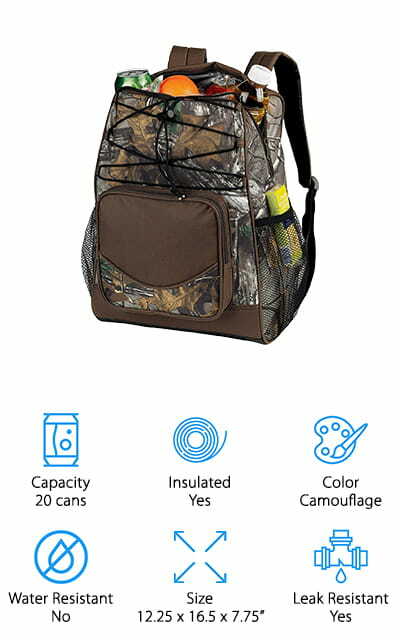 The bag we reviewed comes in a brown camouflage print that’s great for blending in during backpacking or hunting trips, but you can also get them in other fun colors like black, green, red, blue, or grey. The main part holds up to 20 cans and is well insulated to keep everything cold or warm – whatever you need. It’s also leak resistant, so you can pack it with ice to keep your drinks super cold! There are two side compartments, a small zippered pouch in the front, and a bungee lacing on the front to add extras like dry snacks, utensils, water bottles, umbrellas, and even a small blanket! The smaller size of this backpack would make it perfect for small hikes, or it could even work well as a lunchbox you take with you to school or work! For a high quality cooler backpack you can take with you pretty much anywhere, invest in this durable cooler from YETI, our pick for the best soft sided cooler! This cooler can really go anywhere with you, whether you are trekking through the desert, wading through a river, canoeing on the lake, or tailgating your favorite sports team! It can hold up to 24 cans, which can be incredibly heavy, especially if you add in some ice too! If you pack this to the gills, don’t worry about the weight – it comes with durable shoulder, chest, and waist straps to distribute the weight evenly. We also like that this bag is insulated, leak resistant and completely waterproof! You can take this backpack in the water, and everything inside will stay nice and dry! This is the best cooler for those of you who want to enjoy a cold beer or picnic lunch at the beach, park, or on a boat! Next up in our cooler backpack buying guide is the best soft cooler to take with you on your next camping trip! This large backpack can carry everything you need for a night in the wood and keep it all well organized. The backpack is split into two compartments: the lower compartment is an insulated cooler that holds up to 17 liters, and a large upper compartment that’s not insulated for dry goods, clothes, blanket, and more. The bag’s lid also has a separate zipped compartment for small items like sunglasses or your phone, two side pockets for water bottles, and a front zippered pouch for utensils, maps, or some trail mix! We like that the bag is water resistant and leak resistant, keeping rain from leaking in and melted ice from leaking out! 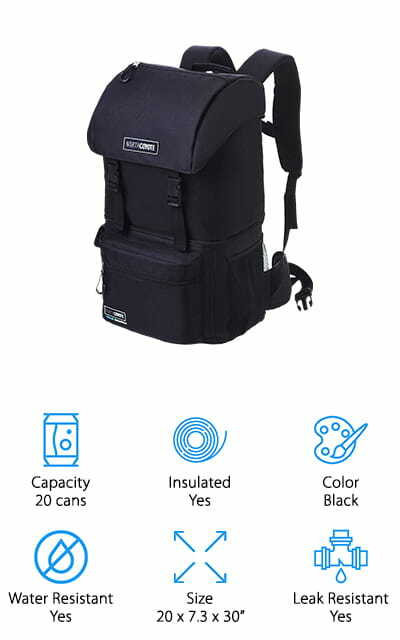 It’s also comfortable to carry, thanks to padded shoulder straps and extra chest and waist straps to evenly distribute the weight for a comfortable camping trip! 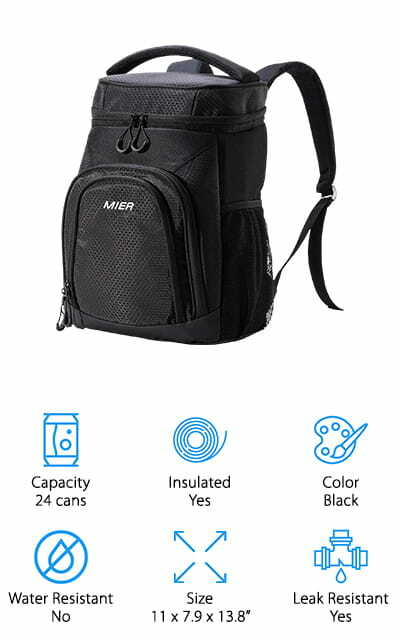 For your next romantic picnic, consider picking up one of these compact and organization-friendly backpack coolers from MIER. The main compartment is tall enough to fit a bottle of wine, keeping it chilled with some cheese, meats, and dessert for a nice meal while watching the sunset. The insulated main compartment keeps everything cool or warm as needed, and it’s leak resistant for added protection if you want to keep your food and wine on ice! We also like that this backpack comes with several compartments to keep everything you need organized and dry. There are two side pockets for umbrellas or water bottles, a top compartment for delicate things like sunglasses or your phone, and two front zippered pouches for utensils, plates, or some crackers to go with the nice cheese you packed! We think this is the best ice cooler to take with you on your next date under the stars, or to a concert in the park! Our best cooler reviews wouldn’t be complete without this versatile and fun cooler backpack from One Savvy Girl! The best thing about this backpack cooler is that it also doubles as a small stool! You can easily unfold it to give yourself an extra seat while hiking or watching your child’s soccer games! It can also work as a small table for you to set snacks during your picnic! This spacious cooler can also pack in a lot of food and drinks, and it is water resistant in case you get caught out in the rain! It also has a pocket on the front for your phone or sunglasses, and a separate pouch for easy access to an extra water bottle while you’re walking around. We think this is the best car cooler to keep in your trunk for impromptu tailgating parties or picnics at the park, or just store it for some extra seating while you’re out and about! 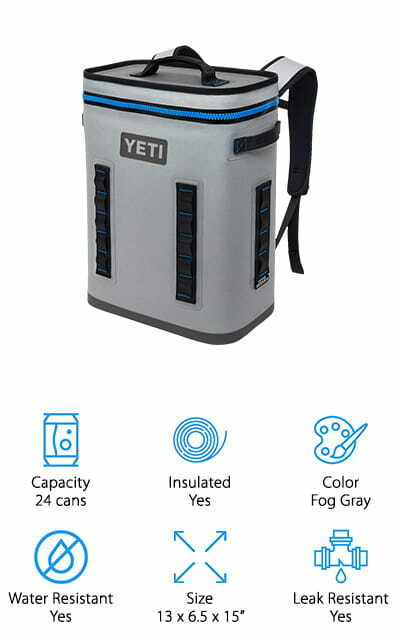 If you need to bring all the food for a family cookout, or you want the best beer cooler for a tailgating party, this cooler from GigaTent can handle both! The main compartment is well insulated, leak resistant, and easily stores a case of beer with ice to keep it super cold! If you need to bring the food for a cookout, no problem! This bag stores whatever you need and everything will stay organized and easy to access! It has two zippered pouches to store utensils, napkins, and small items, along with two side pockets for water bottles, grilling utensils, or wipes. The bungee lacing on the front allows you to tighten or loosen the bag to keep everything secure. You could also use it for a blanket, extra jacket, or a small extra bag for even more storage! This would make a great gift for a friend who likes to backpack, tailgate, or go on road trips! We finish our reviews today with the perfect cooler backpack to take with you on your next trip to the Magical Kingdom! This cooler from Picnic Time has a subtle Mickey Mouse design that will look great while out with your family enjoying some Disney-themed fun! In addition to looking cute, it’s also a really nice cooler backpack! The main compartment holds up to 23 cans, so you can bring plenty of sandwiches, snacks, and drinks to keep you happy all day. It’s also insulated and leak resistant, so your food stays cold and you’ll stay dry while walking around your favorite amusement park. The bag is also water resistant, which is perfect for taking with you on rainy days or to a water park! There are also plenty of extra compartments on the front and side, as well as a bungee lacing on the front, to keep dry snacks, extra water bottles, and sunglasses dry and easy to access.